I don't usually write about current events -- here, or anywhere else, really -- because, for better or for worse, they don't usually reflect my own lived experience, and anyway, someone else probably has done a better job writing about them than I have. There is an argument that, in this time as I make preparations to make havdalah [the closing prayers, service, and meditation for Shabbat] -- something I do approximately once every never at home -- that I should not be writing about this subject at all yet, but the peace of the Rest Day has already been shattered by eleven deaths in Pittsburgh earlier today, and surely my koteb ["writing"; a prohibited activity on Shabbat] shall not breach it any more than it already has been. And I'll give myself a pass on the other front, too: as I expected today's news to pass through me, I found this afternoon that I could not tear myself away from news and Twitter and messengers, hoping in some way to make sense from something that doesn't. And so I write. What is the center of Jewish prayer? The Jewish liturgy is wide, and has a great many moments in it that are poignant. But if you had to choose one prayer -- or set of prayers, or way of praying -- to identify as the "core", that best represents Jewish prayer as a whole, what would it be? The saying is that if you ask 10 Jews a question, you will get 11 answers; from just me alone, I posit a few answers to this question. By volume, perhaps the most time spent in prayer is spent reciting the amidah; recited at almost every service (between three and five times a day, depending on day) first silently, and then repeated by the congregation, the amidah is a litany of brachot [blessings], praises, and requests. It asks for all manner of things, and surely is the meat and potatoes of any service; is it not the case that the whole point of a number of Jews getting together to pray is to communicate with God, and remind God of his blessings, and ask God to look favorably upon us? Is this, surely, not the fastest way to bring the day of the arrival of moshiach [the Jewish Messiah; not necessarily the same as the Christian version of a Messiah]? But maybe sheer volume -- time spent standing and bowing and standing and sitting -- is not the right metric for what the center of Jewish prayer is. Perhaps we can look in other places; perhaps things that happen only once a year, the true questions of life and death, could qualify. After all, Yom Kippur [the Day of Repentance, spent fasting for 25 hours and praying for almost all of one's waking hours] is the holiest day of the year, and I've always found that the Unetanneh Tokef -- not even a prayer, but a simple reminder of the holiness, and a thematic reminder of why we were there -- was the crux of Yom Kippur. The Unetanneh Tokef starts by reminding us of the awesome power and weightiness of the day's task: "You [God] open the book of records, and from it, all shall be read [...] and with a great shofar it is sounded, and a thin silent voice shall be heard [...] as a shepherd herds his flock, directing his sheep to pass under his staff, so do you cause to pass, count, and record the souls of all living [...] and inscribe their final judgement." But immediately after being asked to ponder "who shall live, and who shall die; who shall live out his days, and who shall not", we are reminded: "but teshuvah [lit: "returning"; often, "repentance"], tefillah [lit: "attachment"; often, "prayer"], and tzedakah [lit: "justice"; often, "charity"] annul the severe decree!". Is it not the core lesson of Judaism that by the simple act of good works, we are all assured forgiveness for our transgressions? Is it not a hopeful lesson about humanity, that we all are entrusted with the capacity to grow, and that our errors from last year need not be a death sentence, as long as we are honest with ourselves, and grow? Even if we do not do the mitzvah [good deed; commandment] of prayer once in a year, the Unetanneh Tokef implies that the sincere commitment to doing better the next year is sufficient to merit another chance. Is that not the center of Jewish prayer? Some argue that the center of Jewish thought is derived from the Torah and Talmud [a collection of rabbinical thinking over time], and that the best form of prayer is actually Torah study. Every Saturday, scrolls are taken from the ark, and the words of the Torah are chanted aloud in ceremony. Hillel summarized the nature of the Torah as such, when asked to teach Torah while standing on one leg: "that which is hateful to you, do not unto another: this is the whole Torah. The rest is commentary -- now go, and study". The second part of Hillel's note -- "now go, and study" -- does not mean to say that the rest of the Torah is unimportant, but he certainly places an emphasis on the uniquely human aspect of our actions in light of Torah. But if the rest is important commentary, where in it do we source the center of Jewish prayer from? We could consider the portion of the Torah that we recite in each service, the v'ahavta [a section from Deuteronomy], that starts: "and you will come to love the Lord your God with all your heart and with all your soul and all your might", and goes on to discuss the ways that you should remind yourself of Torah -- at the end of the day, finding ways to remind ourselves of the human requirement to behave ourselves. In that, we get the words of God, and the reminder of humanity, all in one: and that must be prayer. Shema yisrael, Adonai eloheinu, Adonai echad! Listen, O Israel, Adonai is our god, and Adonai is one! The shema expresses the core belief of Judaism, with each word having its own meaning. It's obvious to say Adonai eloheinu -- "Adonai is our god! ", as a reminder of "the obvious". The claim that Adonai echad -- "Adonai is one!" -- is somewhat less obvious, though: did we not already say that there is only one God? Instead, perhaps the claim of echad calls our attention to the "one-ness" of God with us, and with the Earth; the claim that Adonai is everywhere, even if we look, even if we don't look. The Hasidic tale that "one among you is the Messiah" compelled the Yeshiva members to treat each other with respect, and the claim that Adonai is in everything and each of us compels us to treat each other, and each thing, as if they themselves were the Holiest of Holies. And to start, we are reminded that the most important part is that we "Listen!" -- listen to the teachings, listen to the rest of the shema that follows, listen to the v'ahavta that follows that, listen to the amidah that follows, listen to the Torah reading that follows that, and then listen to each other when we're done, for in each of us is the Divine. "Listen, O Israel! ", indeed. Today, I focus on that -- the shema -- claiming that to be the center of Jewish prayer. It is said that a Jew's last words should be the shema. Rabbi Akiva was executed by the Romans for the crime of teaching Torah; as he found himself in the unspeakable agony of having his skin flayed alive, he did the only thing he could: he intoned in a clear voice, the shema. He extended the final syllable of "echad" to ensure that it would truly be his last; he completed the prayer as he died. Roi Klein, a soldier in the Israeli Defense Force, in 2006, jumped on a live grenade to save the lives of his fellow soldiers. The reports were that as he did, what could be heard from him, repeated until he died, were the six words of the shema. I know the makhzor [prayerbook] that the Tree of Life congregation in Pittsburgh uses on the High Holidays, because they're a Conservative synagogue, and so they use the same one that I have read from the past years at Kol Emeth. We use a different martyrology at KE than is in this makhzor, but I've read the one from the book. Yom Kippur is an obvious time to reflect on the millions lost in the Holocaust. It may not be a surprise to hear that the shema was not an uncommon occurrance to hear in the camps; the sound of death, everywhere. I used to walk past the Tree of Life congregation every so often when I lived in Pittsburgh. Some of my friends lived about three blocks from there. I know someone who attended services there. This morning, before I had read the news, I got a text message from a professor that I still keep in touch with: "With respect to this morning's synagogue shooting in Squirrel Hill: Luckily, I wasn't there." I learned about it on the way to the gym today, but didn't know the body count yet, or whether there were bodies. When I stopped for lunch, I saw that it was up to seven dead so far. Over the course of the afternoon, I kept compulsively refreshing anything I could find, hoping that there would be good news, or hoping that somebody would have a comforting take on it, or hoping that something would validate the insanity of this happening in Squirrel Hill, of all places. Nothing was of comfort. I kept imagining, like Rabbi Akiva, eleven Jews killed for the simple crime of studying Torah. Ordinary Jews, who came that day to bask in the peace of Shabbat. Ordinary Jews, just like me, there for whatever their reasons were -- for their God, for their community, for whysoever they showed up this morning. I don't know what they were davening [praying] at the time. Maybe they were actually reading Torah. Maybe they were sit-stand-bow-sit-stand-bow davening the Amidah. Maybe they were rejoicing in the v'ahavta. Maybe, like Rabbi Akiva, they were chanting the shema. At the end of Shabbat, there is a closing ceremony, called havdalah. 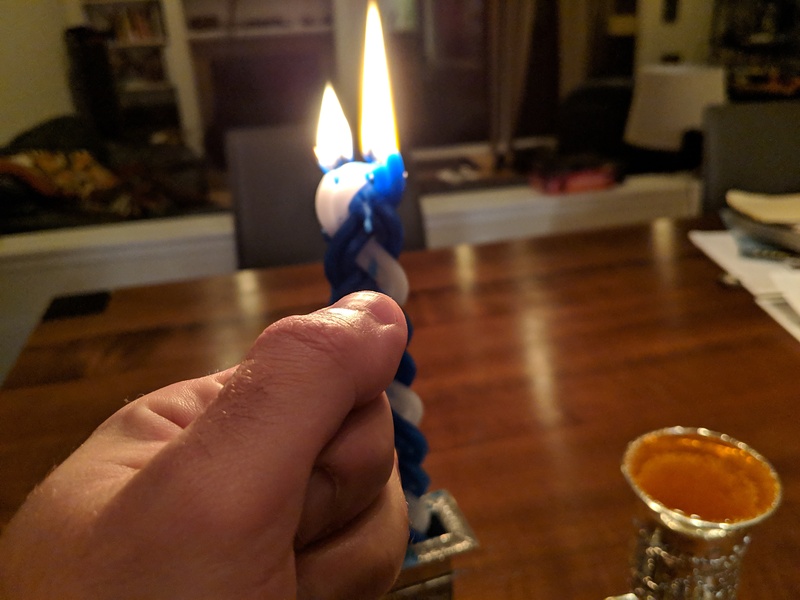 Havdalah is kind of a bittersweet moment; as the waning hours of the sweetest day of the week leave us, we try to capture parts of the Shabbat experience to take with us into the new week that comes. We pass around b'samim [fragrant spices] to smell, as a reminder of the fragrance and joy of Shabbat itself; we drink some wine, as sweetness; we light a special many-wicked candle, with the multiple flames joining as one, and we observe the flame's reflection in our fingernails. Havdalah is a time of separation; the separation of the special from the ordinary, light and dark, secular and divine, and we say a bracha for that separation. Traditionally, we greet the new week at the end by wishing each other shavua tov ["a good week"], at which point we can go back to our daily business. After a Shabbat like today, it's hard to imagine adding more separation to our lives, to move further from the day of peace. In the Jewish tradition, it is mandatory for mourners that in the first 30 days (or more, depending on who they are mourning), they say a prayer called the "mourner's kaddish" every day. Puzzlingly, the mourner's kaddish actually says nothing at all about death -- it's, in fact, a simple glorification of God. And, oddly enough, it is completely prohibited to say kaddish alone, and instead, kaddish must always be said in a minyan [a group of 10 Jews]. The reasoning makes sense, once you hear it: it is to force the mourner not to distance themselves from the community, to make a public affirmation that they are still of the living. And, it is to force the community to say that they are there with the mourner. So, although I have only made havdalah myself once in my life, I got out my candle, and kiddush cup [cup for wine], and bag of b'samim tonight, and with a quiver in my voice, made my way through the brachot. It seemed like the only option I had, really: whether the world seems ready for the separation or not, Shabbat is still ending, and the week is still about to begin. Baruch dayan ha'emet [literally: "Blessed is the true judge"; a phrase said upon hearing of a death]. And, as this horrific Shabbat draws to a close, wishes of -- somehow -- a shavua tov. Although the Facebook and Twitter posts that I originally shared this from are friends-only, this post is public; please feel free to share it in any way you like with anyone that you think would benefit from it. And if you don't have a Dreamwidth account, but you want to get notified so you can read more things like this when I write them, I also have an e-mail list; I promise I'll only send mail for things that I write that go here on this blog. The Pittsburgh Post-Gazette has an agonizing piece about the kind of community that Squirrel Hill is, in case this wasn't enough for you.